1. Changed the opening title music so that the percussion instruments heard when “Marvel” flickers by is the same as in the first two films. 5. Cut Peter’s facial expression when he falls down the side of the building during the New Goblin Air Battle. 11. Removed the little boy telling Spider-Man not to kiss Gwen. 12. Cut out Peter tipping sand from his boot and spitting sand. 13. Removed Mary Jane seeing the headline on her way to dinner with Peter. 14. Got rid of the random shot of Spider-Man swinging through the water when Sandman is getting washed away. 15. Removed Peter shutting the suit in the chest after he first uses it; he looks in the mirror, opens his shirt, looks own at the suit, then looks back up at his reflection, and the sound fades into his conversation with Aunt May. It works quite nicely. This was done so that I could incorporate the shot of Black Suit Spidey swinging to meet MJ; in this edit, he never decides not to use the suit, and therefore is entitled to wear it to see her. 16. Removed MJ arriving at Harry’s penthouse. 17. Removed the dance sequence between Harry and MJ. 18. 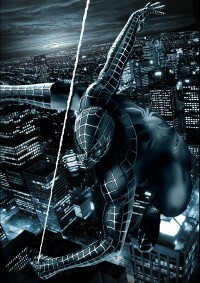 Added a short scene of Black-Suited Spider-Man swinging through the city on his way to meet MJ. 19. Toned down the breakup scene; I basically just removed the crying and a couple of lines from Peter. 20. Cut the waitress talking to Harry at the diner. 21. At the end of the shot of Peter sitting on his bed thinking about Harry, instead of having Peter look towards his trunk, we fade into the now black-and-white shot of Peter looking at the symbiote symbol in the mirror. This way we can really feel that he’s thinking carefully about what he’s doing. 22. Heavily edited the Harry/Peter battle in Harry’s mansion. It’s now much more climactic and intense. I took out the original score and placed James Dooley’s “Trinity” over the top, and pasted in any sound effects that were needed for the scene. 23. Changed the music and sound effects for the scene where Peter finds Brock’s headline, and did a bit of re-structuring. Peter doesn’t wink or glance at any girls. 24. Removed the entire “Funky Souls” montage. This was originally going to remain in the film, with all of the strutting removed and a shot of Black Suited Spider-Man swinging through New York inserted into the montage. However, when I watched the film through, the music didn’t really fit in with the dark tone that I had set for the film, so I removed it. 25. Cut out Peter’s dance in the Jazz Club, he now only dances with Gwen. 26. After Gwen leaves, while Peter rubs his chest again, we once again fade into the B&W shot of Peter looking in the mirror. 27. As a continuation of the flashback added after Gwen leaves Peter at the Jazz Club, the scene of Venom jumping out at Peter from the mirror is added just before Peter spins around and hits MJ. It’s a very sudden moment, and fits in well with the notion that it wasn’t Peter hitting MJ, it was the suit. Also, All flashbacks up until this point are in black-and-white; given the sudden nature of the scene (it lasts for 11 frames, less than a second) and the fact that it isn’t a flashback at all, and more of an intrusion of his mind, I decided to make that scene in colour. I quite like the way I’ve done it. 28. Another addition to the whole black suit portion of the film is that I changed the greyscale of the film for all the scenes after the Harry fight. The scene in the street with the news headline, Brock’s humiliation and the Jazz Club scene have all had a black-and-white blend with the colour to make the image a lot paler and kinda darker. As soon as Peter hits MJ, the colour surges back to the normal colour scheme, so that we see Peter being pulled out of this dreamlike state and back into the real world. 29. At the end of the Church scene, Venom swallows the camera and we stay black for a couple of seconds while the roar echoes out, and then fade onto Peter in the shower. 30. Modified Venom’s voice, to make it deeper. This was the only change I could make to Venom; at one point, someone suggested I add a huge slimy tongue, but that would require a LOT of CGI for a LOT of shots. 31. Cut as much of the news report as possible. This meant cutting Venom’s message in the web, but all in all, it’s not really missed too much. The film cuts straight from Peter looking at the suit to Harry holding his head in his mansion. 32. Removed the scene with Bernard explaining to Harry about Norman being responsible for his own death. 33. Removed a shot of MJ screaming in the car, it’s really obvious that she’s not scared (her mouth and eyes show a happy expression). 34. Cut Venom’s perverted line “My Spider Sense is tingling!”. Peter says “My god, Eddie!” then Venom pulls MJ towards him, Peter leaps forward and Venom punches him away. It works well. 35. Slightly shortened Eddie’s conversation with Peter in the web. 36. Removed a few shots of Peter’s face when Venom’s talking to him in the web. 37. Removed the news reporter from when Sandman is beating Spider-Man. 38. Cut a shot of the little girl crying when Sandman is beating Spider-Man. That scene is all about MJ and Peter, so I cut all the shots of the crowd Oohing and Aahing, so the girl went too. 39. Cut the boys saying “Awesome, wicked cool!” When the pumpkin bomb goes off. 40. Shortened Harry’s conversation with Peter when he saves him, Venom attacks them almost immediately so that we see he’s not about to wait up for anyone. 41. Removed Jameson’s conversation with Raimi’s daughter. 43. After Venom knocks Harry aside and the bars fall around him, I have cut all the shots of Harry until he jumps in front of the glider. His death comes as more of a shock, although in saying that, if you’ve read this list and haven’t already seen the movie then it won’t be much of a shock. But still, it works better. 44. Removed the shot of Peter stretching out for the bar, he now just webs it towards him. 45. Added “People Get Up and Drive Your Funky Souls” to the end of the credits. It goes from the end of Signal Fire to the start of the fan-edit credits I put after the official ones. 46. Added some new credits at the end of the original ones, to do with the fan edit of the movie. I watched your edit having never seen Spiderman 3. In fact I honestly did not even like the second Spiderman very much. But was interested in your edit, and I like to watch other peoples fanedits at least for reviewing purposes. I didn’t read your list of cuts in detail until after my viewing. You’ve done a first-rate job with your cuts, re-arranging, changes, and decisions on what to change. Really, I am very impressed. There were no glaring mistakes, no bad audio transitions, and I honestly feel that it would be possible to show this to someone who hadn’t seen the original and not have them know it was a fanedit at all. After reading your log of changes, I was even more impressed. Lots of crap has been removed here. Also, some of your additions were fantastic, I loved the flash frames of venom when Peter turns and hits MJ, that should have been in the original. Likewise the use of muted colors which then pop back into full color after he hits MJ was well done, and subtle enough that I only noticed when the colors came back. My only real complaint is that I did notice that the B&W flashback to peter looking at the black suit under his clothes was used at least one time too much, it was just too many duplicates of the same scene, and I don’t think it was necessary to sell us on the idea that the suit is changing his personality. Also, not really a complaint, but when Peter goes to the Jazz club with Gwen, it was a little weird when he excuses himself… then comes back a couple seconds later to ask her to dance. I wondered what he was doing. But I quickly excused it as there could be any number of explanations and it worked fine. I suppose if I did have another complaint it’s that I wish more could have been cut… but that is because I think it just isn’t a very good movie. The CGI fight scenes were horrible, and the plot was weak. I hated Sandman so much I was wishing that I could be seeing some sort of hybrid between your edit and the No Sandman Edition that came out recently (but I didn’t see that, so I don’t know how well it even works to remove him from the story). I like what you’ve done here though. Also I didn’t realize you replaced the music during Peter and Harry’s plainclothes fight, so it must have worked well enough for me. Audio and video were great, no complaints. I’ll never be a fan of the movie, but you made an edition that was actually watchable for me. For that, and for so many of the gutsy additions and clever changes that were more than simply removing bad scenes, you get 7 stars. I ended up converting the .mp4 file to a .mpeg to put it on a dvd. All I have to say is that I thought was that this was a solid fanedit. I loved the footage of Black Spidey swinging to see MJ at the park. There are some things I would have cut. But I understand that the purpose was to take out enough to make it a darker film. I did like the change of not seeing MJ get off the elevator and Harrys and we just cut to them reading the play. Also, loved the second fight between Harry and Peter. the music that nows plays it with is very epic and operatic. which is what it should have been the first time around.